Everyone gets a little nervous right before a trip, Do I have everything I need? Am I missing anything? I hope I didn’t forget anything. Stop stressing I have a few tips on what you need to do in order to plan for your trip with enough time to sit on the couch and sip on a hot cocoa, coffee, wine, or a stiff drink………..
Don’t wait until the last minute to pack, that will only lead to stress and more than likely you actually forgetting something you really wanted to take on your trip. Trust me I learned my lesson the hard way. (Let’s just say I didn’t have the right shoes for my outfit and the ones I did pack weren’t exactly the most comfortable). Let’s get organized. Make a list about a week before your trip (sooner if you really want to get it out of the way), with everything you need to pack for your trip. Once your list is made it’s easy sailing. Start as if you had no clothes on and go from there. I start dating my list with how many days I’ll be there so I know how many day time and night time outfits I will need to take. For us women that includes shoes and accessories. 1. Underwear (put the amount you need to take) I double mine, I use one in the morning, one at night and a just in case you never know kind of underwear. 3. Socks (If you are a women you might not need any depending on your preference in shoes, but if you are traveling now in December, make sure to take plenty). Okay so I think we have the essentials …. 4. Remember if you marked your list with Monday, Tuesday etc, then count the amount of days you will be gone and count how many day and night outfits you will need. Example: I will be gone Friday to Friday – So I have to take 7 day outfits (I do not include the day I am leaving) and 7 night outfits (not including the day I leave). Right here I already know how many outfits I need without having to over pack. If you do not over pack you have no choice but to wear what you take. If you really can’t help yourself and you have to take a “just in case outfit” only pack about 2 extra “just in case” outfits. If you are a man, you have no idea what I’m talking about, just pack 7 day shirts, about 4 jeans/shorts/sweat pants and 7 night shirts/nice & casual and about 2 jeans and 1 pair of slacks. 5. Shoes, shoes and shoes. Okay ladies, I know it’s hard because we have our day shoes, our night shoes and our of course “just in case” shoes. Really try to limit yourself. How many day shoes do you really need? Take one black and one brown and maybe one pair of tennis shoes. Night time, do the same, one black, one brown, and of course “the just in case” shoes. (Again I know it’s hard but try to think of the time you actually wore every shoe you brought on your trip)? MEN- Pack your tennis shoes, and 2 pair of night time shoes (black and brown) (Of course you can take any other colors you want, I just write black and brown because they are the neutral colors that go with everything, so you can’t go wrong). 6. We now have our undergarments, day and night clothes and shoes. So what is next…. For Women: Depending if you are like me or not — I usually take my blow-dryer (because the ones in the hotels usually don’t work as well, but if you can leave it, that is one less thing to pack), iron (for hair), hair brush, makeup (brushes etc), clips/bands for hair, hair products, and cream (If I’m leaving anything out — this is exactly why I write myself a list, imagine if I didn’t). For Men and Women: Deodorant, Shampoo & Conditioner (the ones in hotels are way too small), Razors, Shaving Cream, Perfume/Cologne, Toothbrush and toothpaste. (If you need other stuff mark them down – ex: contacts/solution, sunglasses etc). 8. Pack any vitamins, icy-hot (if you have back pain), meds you may need. 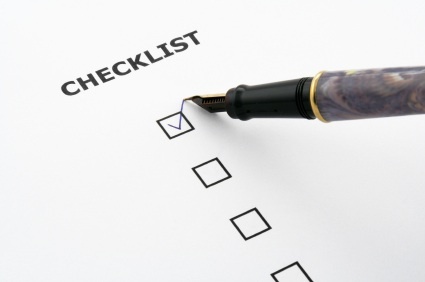 You are all set, your list is done and now all you have to do is pack it and check it off your list. The week before your trip start packing whatever you can and checking your list off, and whatever you need to pack last minute like toothbrush etc, you check off the day of or the night before.